Many reading this headline probably did a double take. Adidas, making baseball bats? Have I lost my ever loving mind? No you have not. Well, you might have–but that has nothing with the accuracy with which you read this title. Adidas, a world leader in sports apparel, has entered the playing field of baseball bats–and, quite frankly, the… Jump to the full review. We aren’t the only ones to have information about the EQT. Other places, in particular those who sell bats, usually have a boiler plate write up on the specs of a bat. Many of those we reference to make sure we are seeing what we should be. Here are some more references for the 2015 Adidas EQT review. Adidas, making baseball bats? Have I lost my ever loving mind? No you have not. Well, you might have–but that has nothing with the accuracy with which you read this title. Adidas, a world leader in sports apparel, has entered the playing field of baseball bats–and, quite frankly, they’ve made a pretty decent first impression. Without much fanfare, actually, they’ve sent their EQT bats to a half dozen or so NCAA teams during the 2014 season who were not under any contractual obligation to use any particular company’s bat. Success? Only if you think getting drafted 4th in the MLB is a success (which I do). Clearly the bat proved its worth to players at the highest level of metal bat baseball. As of just a few weeks ago, the bat was for sale at major bat retailers in a BBCOR design. Both bats make a great ping sound at contact. With an enlarged hitting surface made possible by the Damascus alloy and the thermoplastic end cap, Adidas came to the ball park ready to play. If critics want to remind them of the aluminum barrels, it needs to be pointed out that at the BBCOR regulation levels, alloy barrels have as much pop as composite barrels and, oh yeah, they are about $100 less expensive. 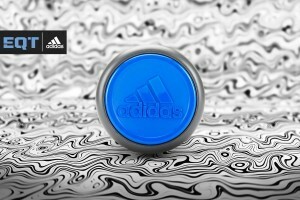 In this regard, Adidas appears to have approached the market thoughtfully. Both bats also have an appreciable Damascus steel look and, for some, such simplicity comes at a relief since other bat designs seem bent on blood stains, neon colors and crossbones. The Adidas EQT franchise begins with two bats: the X1 and X2–both in BBCOR sizes. The X1 is a semi-stiff one-piece alloy shtick with a balanced load and large sweet spot. The metal is a very strong (and proprietary) Damascus alloy that allows for a larger barrel face and a recessed thermoplastic endcap. This allows for a larger hitting area and more effective plate coverage per swing weight. In comparison to a handle loaded BBCOR bat like the Easton S1, the EQT X1 has a similar feel to the DeMarini Insane–which is also a single piece aluminum stick. As a reference point, by my calculations, the EQT swings with the same weight as Easton S1 that is one inch longer than it. The X2 is a hybrid two piece that uses a proprietary permalock connection feature to weld the composite handle and aluminum barrel together. It also has the thermoplastic endcap for optimal swing weight and plate coverage. For those who want a less stiff hit and some sting dampening on mis-hits, then the X2 would be the preferred route. The composite handle should also allow for a bit of a smoother feel through contact–enticing if you are into that kind of thing. It is rumored the EQT franchise will soon include both the Youth and Senior league barrel sizes but there is nothing official as of yet. But of this much we are certain: a familiar name has shown up at the neighborhood baseball park and lots of folks who know a lot about baseball are considering picking him first. It’s time to get some hot dogs and find out if by plain and simple things Adidas can make its mark on a hyped metal bats industry. And, if I were a betting man, I’d feel confident putting some chips on the new kid.